"Trust. Betrayal. Deception. In the C.I.A. nothing is what it seems." 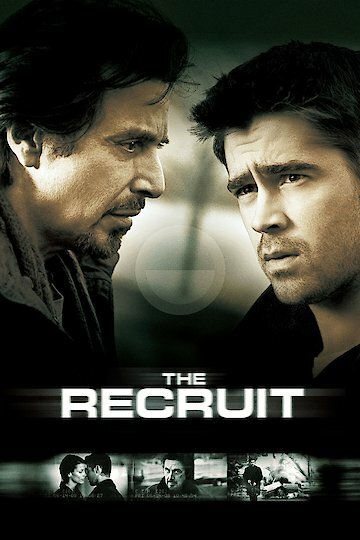 Made in 2003, The Recruit is an American and German spy film, starring Al Pacino, Colin Farrell and Bridget Moynahan. Colin Farrell, a brilliant computer analyst, graduates from the top of his class at MIT, planning out his next move while working as a bartender. He's approached by Pacino, a recruiter for the CIA, who claims to know Farrell's father. Farrell doesn't want the ordinary working life, accepts Pacino's offer, and is shipped to a secret training facility. He's admonished that nothing is as it seems. At the training facility, Farrell meets and falls for fellow trainee Moynahan, who is his equal in every way. A mole is suspected within the training facility and Farrell is assigned to find it. At the camp Farrell is tortured, but he refuses to cough up the names of his CIA mentors. When he learns that Moynahan is suffering because of his silence, he gives up the names. He learns that this is just another training exercise when the walls behind him open, revealing an audience including Moynahan. The main focus of the film turns to a computer virus, the divergent and convergent behavior of Farrell, and Monyhah and Pacino's betrayal of the CIA. The Recruit is currently available to watch and stream, buy on demand at Amazon, Vudu, Google Play, FandangoNow, iTunes, YouTube VOD online.